Baseball is a game of incremental advances and steady progress – from first to second, from the minors to the majors – and traditionally, that same progression has been mirrored in the sport’s technology. Enter the Nike Vapor Collection: ultra-light, ultra-fast equipment engineered to accelerate baseball athletes to the next level. Nike Vapor represents supernatural speed and the product attributes required to attain it, with lightweight support and lockdown fit. In baseball, speed is the difference between being safe or out, and winning or losing. By enabling athletes to be faster, the Nike Vapor Collection shrinks the field and helps push the game of baseball to new levels. Highlighting the collection, the innovative Nike Lunar Vapor Trout is built with ultra-light cushioning and designed for speed. In addition to the Nike Lunar Vapor Trout, the Vapor Collection also includes the Nike Pro Combat Hyperstrong Slider Tight, the Nike Pro Combat Hyperwarm Player’s Sleeve, the Nike Tru Vapor Fitted Cap, the Nike Elite Vapor Crew and the Nike Vapor Elite Pro Batting Glove. Athlete inspired and validated, this collection fuses the heritage of baseball with innovative technologies that advance the game. The first signature cleat for star outfielder Mike Trout, the Nike Lunar Vapor Trout redefines the balance of speed and power in baseball and embodies the future direction of the game. 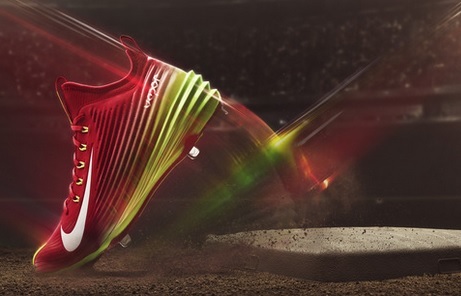 Informed by Trout’s own insights, the Nike Lunar Vapor Trout is designed for the directional speed needed to steal more bases, get to more balls in the outfield, and get out of the batters box quickly. Equipped with a durable, lightweight Nike Lunarlon foam midsole for comfort, the cleat features a split Pebax speed plate for ultra-responsive movement across the field. The midsole also informs a lively aesthetic that captures the spirit of Trout’s game and Nike Vapor technology – sleek, modern, athletic, and extremely fast. Nike Flywire technology and a four-way stretch mesh inner sleeve provide a dynamic fit, locking the foot firmly over the plate when needed most. The Lunar Vapor Trout provides one of the fastest ballplayers in the game with a lightweight mid that offers the ultimate in comfort and support.